John Wisden & Co. Ltd.
Cricketing Allsorts has well-compiled four sections - The Good, The Bad, The Ugly & The Downright Weird. In a chapter on Forgotten Gems under the section The Good, Jo Harman commented: "It suits Jimmy Adams that his most significant Test innings was completely overshadowed. With West Indies at one of their lowest ebbs, he prodded and blocked his way magnificently to 94 as Brian Lara piled up 213 tide-shifting runs at the other end against the greatest team in the world. The match and the series may belong to Lara alone but without Adams' unassuming grit it could never have been. It is almost better that he was dismissed six short of a ton, lest he stole any of the limelight for himself." The author, in a chapter on Bunnies, under the section The Bad, believes no list of bunnies is complete without the tale of Atherton's 19 nervous breakdowns against McGrath. It seemed to crystallise England's inferiority complex during the era: our best boy would walk out, take guard, try and clear his head of the previous day-and-a-half, survey the field, block out Warne's latest wisecrack, take a half-step forward, prod at McGrath's seamer and, feeling the nick, jackrabbit behind to catch the ball sinking miserably into Healy's smug gloves. This was the Nineties. In a chapter Hysterical overreactions under the section The Ugly, Harman observed that "when it comes to cricket-induced hysteria there's nowhere quite like the subcontinent. Indian fans didn't respond well to being dumped out of the 2007 World Cup at the group stage. Riots ensured as they took to the streets in their thousands, burning effigies of their former heroes for shaming their country. The higher the pedestal, the harder the fall - and the previously adored MS Doni fell hard. Furious fans vented their anger on his house and young fans who had grown their hair to imitate their idol chopped off their locks in disgust. But for some distressed fans a haircut wasn't enough. Twenty-eight villages in Haryana decided that cricket was no longer for them and banned the sport entirely, while a West Bengali farmer was so distraught that he hanged himself at his Calcutta home." Celebrating the best of cricket, the worst of cricket, and everything in between, it is an engaging, witty and affectionate look at the game's unique appeal. Jo Harman, deputy editor of All Out Cricket magazine and former editor of The Cricketers' Who's Who has covered a wide range of topics and deserves full marks for this splendid book. David Lloyd, in his foreword has remarked: "The great characters, outstanding performances, and entertaining mishaps featured in this book help to sum up why I fell for the game and why, so many years later, I'm still completely hooked. So sit back, put your feet up and enjoy the best, worst ugliest and weirdest that cricket has to offer." 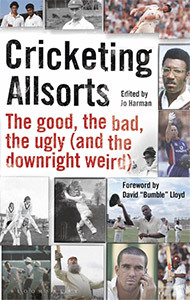 Delightfully produced book, Cricketing Allsorts has something of interest for every cricket enthusiast. The painstaking research involved in compiling the facts is commendable and the book should have a place on our shelves. Pleasingly designed, the 279-page book is reasonably priced.